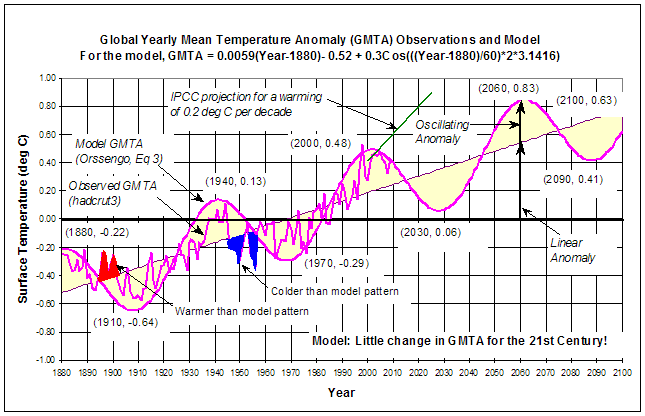 May UAH Global Temperature – unchanged | Watts Up With That? ← Quote of the week – I get an endorsment by Bill McKibben, plus a certificate in "certified planet wrecking"
One thing that has got me thinking is this. El Nino’s, the warm oceans heat the air, a proportion of the heat goes back into the oceans and the rest into space. Does this mean El Nino’s are really a net heat loss for the earth? And the more we have signifies that the planet is cooling? Smoothed, it’s still a nearly perfect sine wave. What’s striking to me (and has been for awhile) is how relatively consistent 2001-2012 is, compared to what came before. Almost like a plateau of some sort has been reached. I was only thinking about that a minute ago and I thought I bet it is unchanged. 1. It looks to me like it should be fit with two flat lines with a step up in 1997. 2. Why the change from 3rd to 4th order polynomial? 3. The ‘entertainment’ fit appears to be useful in defining the endpoints of the total increase, but the sharper curve at the beginning kind-of ruins that. Dang it Dr Roy, why did you go and switch on us, and move from a third order polynomial to a fourth. Are you trying to hide something from us or what ? This is going to start one cherrypicking buzz for sure. Well perhaps you have evidence that fourth order is more entertaining than third order. I have serious doubts about the precision and accuracy of these measurements. who is to say who is right and who is wrong? When sea surface temperatures in areas remote to the tropical Pacific warm during an El Nino, it’s not because the air is warming the ocean. For example, the tropical North Atlantic warms about 3 months after the eastern tropical Pacific. It warms because the trade winds slow in the tropical North Atlantic. Slower trade winds in the tropical North Atlantic yield less evaporation there, yield warmer surface waters, also yield an increase in Ocean Heat Content. The weaker trade winds also upwell less cool waters to the surface. According to the Interweb, we’re all supposed to be evolving to the fourth order (or something) this December. Dr. Spencer’s polynomial is merely (ahem) ahead of the curve. Does this indicate that the Peruvian upwelling might be pulsatile? Just curious. I noticed a similar tongue in spring of 2011 when some were calling for an el Nino, but the cool tongue ended up developing into a small La Nina dip. Could the same happen again? I guess as you suggest its in the balance and could go either way. Does the persistently very cold north Pacific (according to Ansys) have any significance? As for western Europe, its just turned very cold and wet, just in time for the British Queen’s diamond jubilee, and (more importantly) our girls’ school party – both a washout. It would be nice to have a view on the development of the anomaly. If the anomaly is going to step up to, say, 0.4 C (which a 0.1 deg C trend might indicate), let’s not be surprized by it. And if it is, the fourth-degree-for-entertainment function is going to take a big chunck out of Roy’s credibility. I learned the hard way that there are no informal projections, only informal settings. If you don’t think the polynomial fits, don’t wear it. Personally, I am still reeling from Joe Bast’s ill-considered billboard, and that he doesn’t appear to understand how that undermines the skeptics’ credibility. When in doubt, let the numbers speak. If you’re not sure what they’re saying, don’t interpret. If you’re interpreting, or even giving the sense you might be interpreting, then make sure it’s a serious effort and suitably caveated. While polynomial fits have no predictive value – true – it just so happens that a 4th-order polynomial using just the 1979-2002 data does a much better job of ‘predicting’ the last 10 years than any climate model. Try it. Stop me if I’m wrong…but isn’t the graph he fitted still a third-order polynomial? A fourth-order polynomial should have both tails pointing in the same direction…. Never mind; I forgot it’s fitted only to the current range of data. get a life. You’re full to the eyebrows both re Bast and Spencer. Even if the global temp is stable, we’re not done with weird weather for this half of the year. As a counterpoint to the cold and snow in Sweden and the (well, hardly uncommon) rainy pall on the Royal Diamond Jubilee, half of India has been suffering through a heat wave several weeks long, with several hundred dead and widespread water shortages. And, the prediction is that the heat will rise over the coming week. And Iceland has just emerged from a unusual bout of warm weather but could now drop to average or below normal. The data is moving up, the curve is moving down. If the data continues to move up, the AGW crowd will say the Roy was sloppy, frivolous, biased or wrong. This is what we say about Hansen and GISS, right? I see no reason to provide such an opening. If Roy has an opinion about the future, he should express it and explain his reasoning. If he doesn’t, he should realize that he is a leading scientist in the field, and even a casual fitting gives the impression that this is his interpretation of the data. If you’re a leading pillar of a community, you have the opportunity to be frivolous and right; you don’t have the luxury of being both frivolous and wrong. …..As for western Europe, its just turned very cold and wet, just in time for the British Queen’s diamond jubilee, and (more importantly) our girls’ school party – both a washout. No predictive value? But any graph has predictive value in global warming. I can predict that alarmist will look at any graph and be alarmed. So the big question is, are we headed next for an el nino and warmer temps? Or will it stay neutral? Sorry, phlogiston, I can’t answer your question. The North Pacific north of 20N has been cooling since 2005. If you’re looking at anomalies, there’s a large seasonal component to them in the North Pacific, and they’re approaching the annual bottom of that seasonal cycle. Don’t forget there are two volcanoes (April 1982 and June 1991) which affected the trend over the 2.5 years following by up to -0.3C to -0.5C. Put those impacts back in, and there is less warming overall and the trend moves toward linear. Pull out the ENSO, AMO, solar influences as well as the volcanoes and it is a linear warming trend of 0.047C per decade. By the way, the more you have free parameters in your fit, the better the fit with ANY data with intrisic variation. Bill, I can give you better than that. And I don’t trust the UAH values anymore. I can give you the development of warming/cooling over time. And it shows that earth has been cooling in the last decade. Study this curve carefully and you will see that around 1994 temps went down (negative/decline) as correctly predicted by me. However, Orssengo thought the max would be at around 2000. That means his curve must be shifted a bit to the left. Overall, we cooled about 0.2 degrees K since 2000. That does not yet look like a lot. In fact, showing the difference between the walls inside my house of 0.5 degrees C, my son laughed at me worrying about the 0.2 degree cooling. The problem is that the cooling is not linear. It is on a curve and it is headed further down. Roy, I see a number of “double” tops and bottoms in the graph seemingly marking a change in direction with a significant swing following. To laugh at an epileptic seizure is uncouth, but it is all right to be entertained by a polynomial fit. The crowning of the Queen on the 2nd June 1953 saw rain in London with the maximum temperature 12°C. Yesterday was a wet day in London with the maximum temperature 12°C. in which direction do you think we are heading now? So why include it at all? It’s misleading, dishonest, and discredits yourself. Anyone who understands trends better than “let’s see which options in Excel get the curve I want” knows that this trend line has LESS than no value whatsoever. It is only useful for those who don’t understand, but are easily swayed by false impressions. Say, that gives me an idea, why don’t you include the valueless “entertainment” trend line graphic in this site’s title banner? That way you can show that the site is about what the “entertainment” says, not what the data say. That way you can show that the site is about what the “entertainment” says, not what the data say. So why would you tell it to plot a 4th order polynomial fit? What makes one think that a polynomial fit, specifically a 4th order polynomial, is representative of the actual data? Why not restrain from using *any* fit that requires a “this has no value” disclaimer? When you do trending in excel, it normally also calculates a correlation coefficient when you ask for it. The nearer that value is to one, the more you know for sure that the trend you find is not random. I gather that the r2 of the polynominal fit tried here is probably 0.5 or less. So they know that the fit, even though it looks good, is probably random. With the maths on the table I very much doubt that my values are wrong. Well you seem to know what you’re doing, but I’m not sure that Roy does. If you gather that the fit is probably random, do you think it is because Roy is unable to get a better non-random fit, or because he’s purposefully trying to misrepresent the data? I have not seen any comment from Roy here so I doubt if he has even looked in on the comments here. I hope my point is made though that the “fit” line is less than no value whatsoever. As you say it is “probably random” and that “they know”. Imagine if they overlaid a plot of some truly random data; it would serve only to distract from the real information on the image. Supposing they know it — never assume stupidity when malice is an adequate explanation and vice versa! — then the goal is not to “entertain” but to mislead. Clearly they’re trying to suggest a cyclical trend. Too bad a 4th order polynomial fit isn’t cyclical! I suppose excel doesn’t have a cyclical fit option? You predict decreased temperatures over the next few years. I think there will be a hot el nino year in the next few, and it will be a shocking anomaly for skeptics, and then over the following decade the average will become more like the anomaly… just like what happened last time. If it turns out you’re right I’ll remember that you predicted it. understand, but are easily swayed by false impressions. Can you prove it? How? Say, that gives me an idea, why don’t you include the valueless “entertainment” trend line graphic in this site’s title banner? That way you can show that the site is about what the “entertainment” says, not what the data say. Well, in some cases of multi-frequent curves a cubic fit can show low frequency trends. There is a low frequency decreasing trend since 2009 in the UAH global temperature. – it correlates strong with the UAH global temperature. BTW. It is senseless to argue on i.) nothing, ii.) no value, iii.) less than no value. Volker, you should read what the argument was about. don’t argue with anyone, if you, yourself, have no figures to show. After the monthly updates of Dr. Roy Spencer ‘s UAH temperatures, I do show my same figure of a simulation of the global temperatures out of real astronomic synodic functions, with no comment or question. But you know ‘a prophet has no value in his own country’. That are all nice people, who bring real fun to the world. I was 38 years doing physics with Philips research lab. The problem is that UAH shows warming of ca. 0.2 degree K since 2000 whereas my results show that it has cooled by 0.2 degree K since 2000.
so I would say that my results are more representative. I also query the accuracy and precision of UAH. check my answers to the questions as well. Imagine, I worked almost 25 years for Siemens in South Africa as a laboratory manager /chemist. Germany was better than Holland, (soccer), I think they deserved to win. Looks like Holland is out of the Euro cup….. It may be that you are right. I do not know. I have taken the monthly global UAH data and have analysed the frequencies of the temperature spectra. Additional I have analysed the main frequency of the sea level oscillation (seasonal data removed) by subtracting the linear increase function. I have shown that the main frequency oft the sea level oscillation have the same frequency as one of the frequencies of the UAH temperature spectra, but a better S/N ratio as the temperature spectra. Mostly all of the analysed frequencies can be connected to twice the synodic frequencies of planet couples like Mercury/Earth. By fitting empirical the magnitude of all (11) synodic functions with the help of the UAH data, it does result in a function, which correlates with the global UAH temperature function. But moreover, because the synodic functions are well known from astronomic data, the extend of the present data can be calculated to the future, with the help of other reconstructed temperatures like A. Moberg et. al. of 2 ky back in time, in general for the next 1000 years. The idea to analyse more the frequencies instead of the amplitude is very different to your investigations, and as one could notice here over several month, the monthly updates by Dr. Roy Spencer fit well the astronomical functions. Do you can extend your temperature function to the future? Fine to hear. Experts in techniques have a fundament in science. Do you extend your temperature function to the future? y= 0.0455 ln(x)-0.1273 (r2=correlation coefficient= 0.997). with a correlation coefficient of 0.95. Not so bad either, but I would be a little less confident making predictions on that. If you take that to the present it shows -0.08. If you take that further to the future, say to -14 on my scale (2025), you find a value of -0.2 degrees K. Scary stuff. Let us hope I made a mistake? Study this curve carefully and you will see that around 1994 temps went down (negative/decline) as correctly predicted by me here whereas the green line from the IPCC still wants us to believe that it goes the other way (positive/incline). If the Orssengo curve is correct we will drop a total of about 0.3 or 0.4 degrees C before things turn up again beyond 2030. That means the Orssengo graph must be moved a little to the left? I’ve looked at that again, carefully. 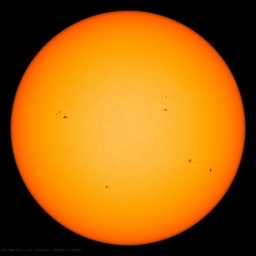 if we take that to 2025, it shows me earth cooling by about 0.12 degrees K per annum at that time. Still a bit scary, but the scale of cooling is a bit less now. All we can do now is hope and pray that Orssengo is right, meaning that earth will start warming up again, beyond 2030. Is he an alias for somebody else? there are two general methods to extend the global temperature to the future. One method is curve fitting using simple trigonometric functions (circle functions) or linear functions. The other method is to analyse all the temperature frequencies in the known temperature spectra or reconstructed temperature spectra back in time as they available for many thousand years with short time increments of year or better month. The latter method takes the nature of the global climate seriously because of the varying global physical heat source. It is not easy to analyse the true frequencies, because FFT analysed frequencies are always sine function frequencies, but if the true time function is not a sine function, because the function is of elliptic nature, the work get astray. This is most important if the nature of the function is like a tide function, because in this case first the frequency is doubled and second it can be happen, that the function shows two or three spike maxima and also two or three spike minima. Such function is known from the global climate periods of about ~900 years of warm climate periods but cold climate periods like the LIA. Both extreme climate times do show more than one spike, but three. It is clear, that a trigonometric gymnastic of one sine or one cosine function as in the first method is not science, because the real data containing the truth of the physical heat source are killed. The main scientific argument, to take the latter method, is, that the frequency of ~900 years can directed to a real heliocentric tide function of twice the synodic function of two real bodies in our solar system. This is evident, if the function is compared with the well known temperature reconstruction of Eduardo Zorita et. al. The conclusion of this result is that real astronomic synodic tide like functions have a better scientific base as simple trigonometric functions without any connection the a geometric structure in the nature. One method is curve fitting using simple trigonometric functions (circle functions) or linear functions. I find for all three parameters that they best fit into a polynominal of the 2nd order (hyperbolic fit). By then, Means are dropping down at a rate of -0.17 degree K.
Altogether, everything still looks scary to me. I cannot believ there is not more research done on this by the universities. Do you Volker or anyone else have a different scenario for 2025? Volker, how do you know Orssengo died? By then, Means are dropping down at a rate of -0.17 degree K PER ANNUM. You do say nothing to it, nor to the method, I have explained. If you think other methods are better, it’s OK. No problem. I did have a look at it and I am impressed with the apparent correlation.. But your prediction only goes to 2014. Can you show it a bit further in the future? BTW, I am still inclined to stay with the Orssengo curve, meaning (and hoping) that 2025 is the lowest point of cooling. He thought it would be 2030 but it looks to me he was 5 years out. By 2025 the climate on earth will be similar to 1980. I wonder what he would have said about my results. I did have a look at it and I am impressed with the apparent correlation. But your prediction only goes to 2014. Can you show it a bit further in the future? The question of a sceptic has no scientific relevance; of relevance in science is that, what IS. If you have (only) a few DNA molecules you can multiply them by the PCR method of Kary Mullis. That is no magic. The question to science is, what mechanism gives heat to the globe, which is in harmony with solar tide functions? We must always have in mind, that reconstructed temperature anomalies are not telling the truth in Kelvin and also that there can be local Earth effects, that can bias the isotopic pattern. Because the first (of three) main peak in high temperature (cycle length ~913 years) has reached its maximum in February 1997, there is a general decreasing of this main function since then until ~2050.